Dynamic Software Integration. Smarter Workflow Automation. 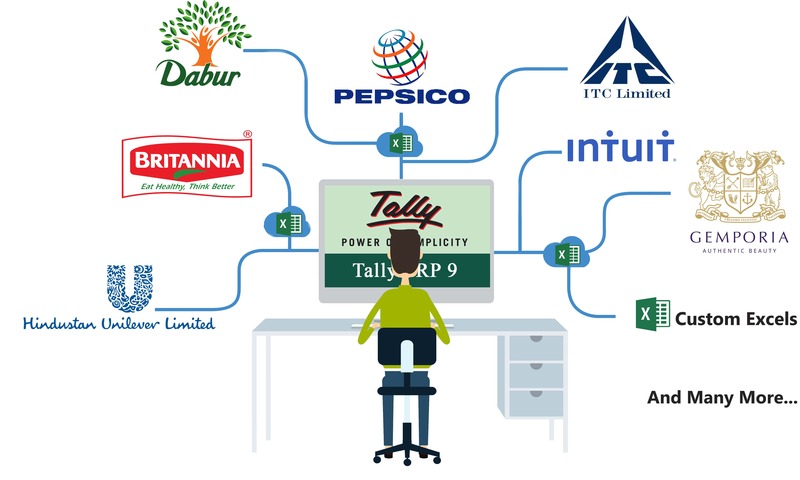 SMART DYNAMIC INTEGRATION SOLUTION is a revolutionary and robust end to end EXCEL to TALLY solution for any Tally user who wants to simplify bulk and duplication of entry in Tally application. 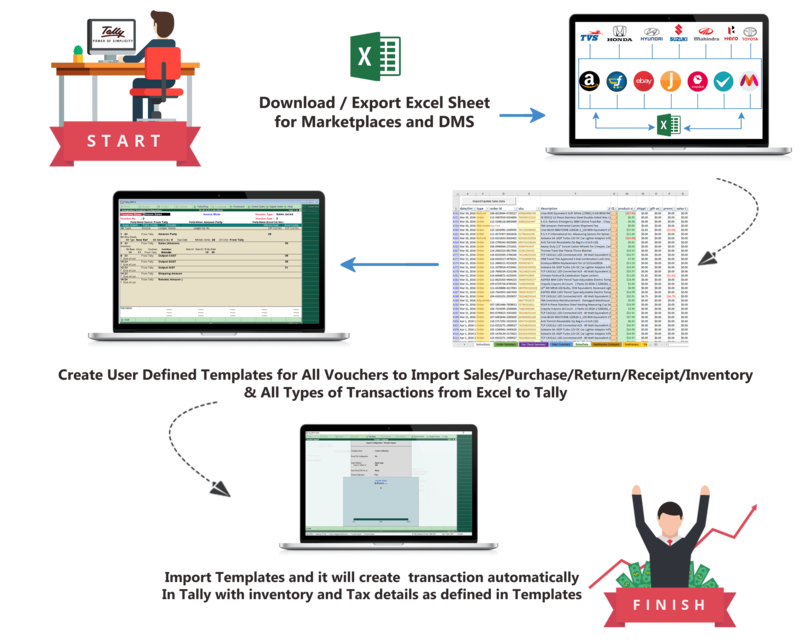 Priyam Infosystems has developed an Excel to Tally import utility that offers any types of data import from Excel to Tally application. A dynamic solution to integrate various marketplaces like amazon, flipkart, snapdeal or any other e-commerce portal, dealer management system/software for automobile and other industries, all types of manual Excel format etc. 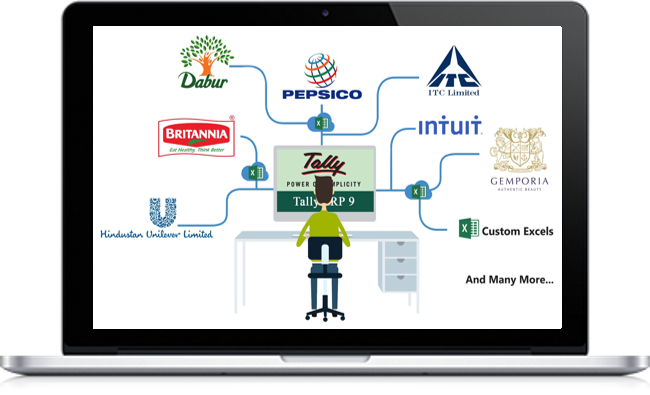 Smart Dynamic Integration Solution is a User Friendly Comprehensive Solution and Seamless Integrated with Tally.ERP9 that facilitates to import marketplace wise excel sheet data for Sales/Receipt/Expenses and Returns for all Ecommerce online portal like-Amazon,Flipkart,Snapdeal,Paytm,Myntra etc. Bulk Entries Import through Excel in Tally.ERP9. Import Bulk Item/SKU from Excel Data. Automobile sales and service dealerships manage DMS (Dealer Management System) for the Sales,Purchase, Services,Warranty and Spares Parts etc, for Principal Company/Vendors. Additionally, need to record and maintain duplicate entries in Tally to manage inventory, financial accounting and statuary etc. Smart Dynamic Integration Solution reduce hassles involved in manual and duplicate data entry from DMS to Tally. SDIS offers you to import Sales / Purchase / Credit Note / Debit Note / Journal / Payment / Receipt / Contra entries with in an exceptionally seamless manner with tally itself effortlessly. Minimum Knowledge required by user to integrate. Create Multiple & User defined Template for Multiple Type of transactions. Able to Maintain : Inventory / Cost Category / Cost Centre / Bill wise Details. SAP Code maintain in Party Master. A Dynamic solution for any complex Excel to Tally Integration for Any Excel Sheet Exported from any ERP/SAP/Dealer Management Solutions or Customized solutions used by any Hospitals, Education institutions, Genesis, Hotels, Dealers & Distributors, C&F Business, FMCG & Many More! 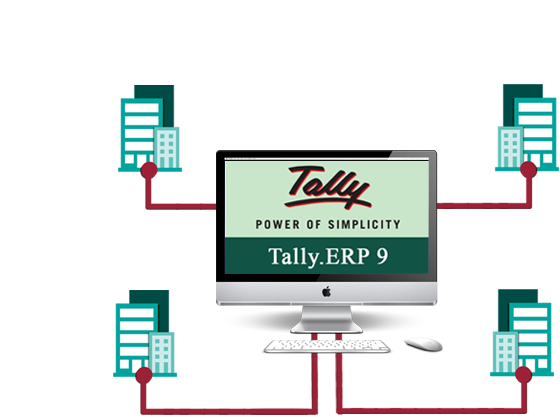 We also do API based integrations to Tally.ERP 9. Solution for All Type of Integration. User Friendly Comprehensive Integration Solution. Available Voucher Type : Sales / Purchase / Credit Note / Debit Note / Journal / Payment / Receipt / Contra. Import Voucher Type : Sales / Purchase / Credit Note / Debit Note / Journal / Payment / Receipt / Contra. Import Bulk Entries with Single/Multiple Items with Multiple GST Rates. Import with Inventory / Cost Category / Cost Centre / Bill wise Details. One Time Setup for Integration for E-Commerce/Automobile or any Custom Excel. Setup Training provided by Service Experts Team. Instant Benefit to Users to start work from DAY 1. Easy Download Template (Pre-Configured) for E-Commerce Business and Automobile Dealers. Fully User Defined Dynamic Templates for any Customized (Columnar) Excel Sheet. Easy Modification in Templates according to changes in Excel Sheet. 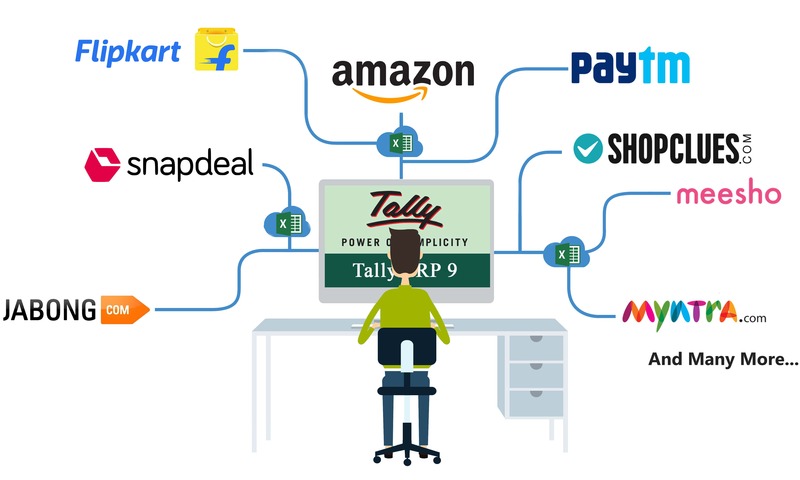 Support All Marketplace providing Excel Sheet or User can make own excel to import in Tally. Additional Information can made (In Column) manually in Excel by User (If Required) to take in voucher. 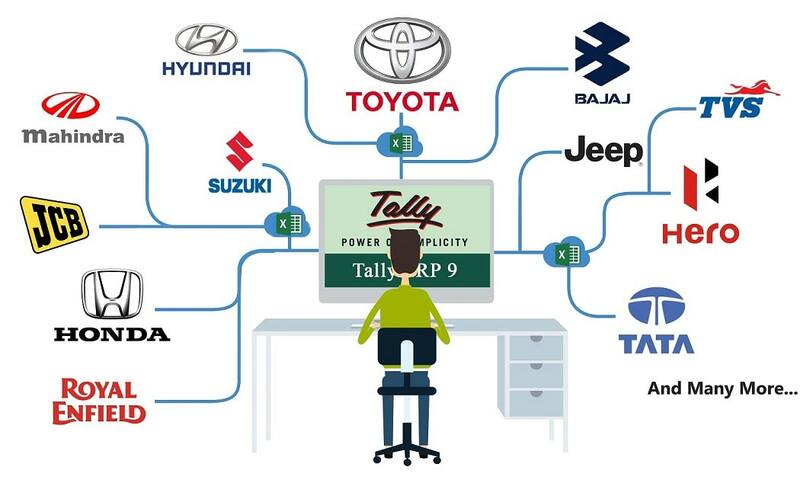 Support All dealers providing Excel Sheet or User can make own excel to import in Tally. Additional Information can made (In Column) manually in Excel by User (If Required) to take in voucher. No Need to worry for any mistakes and duplication with Manual Entry. Accurate Reports in Less Time Frame with effort Saving with Single Bulk Import. Availability for required reporting for more productive work and future planning for business growth. Report of Bill Wise Outstanding with Facility to Export In Excel. Report of Bill Wise Bifurcated Single or Multiple Transaction (Income & Expenses). Facility of Reporting in Profitability for Settled Bill Wise Transaction through Excel Sheet. Outstanding report of Returns Inventory with Damage & Wrong Item. Easy Report in Excel format for Re-Reimbursement Purpose. Facility for Import Inventory and Party Master with all required details with Excel Modification also Available with missing information in Inventory and Party Master. User Needs basic knowledge of accounting to understand the Tally Language for reporting purpose for Best result. Accurate and On-time GSTR Report for Taxation Purpose.